Access to reliable and affordable energy supply is an important factor affecting the quality of life and economic development in any country. Hence, the Indian government has announced its commitment to ensure 24×7 power supply for all by 31st March. Towards this goal many important milestones have been achieved and the year 2018 had been historic for electricity reached every village on 28th April 2018 under Deen Dayal Upadhyaya Gram Jyoti Yojana (DDUGJY) scheme. Now focus is on electrifying every household under Saubhagya scheme. With 9 states already reaching 100 per cent household electrification, this target is also expected to be achieved within its deadline. On the other hand, amendment of Indian Electricity Act is on the anvil. A lot of talk is going on to segregate “carriage and content” in the distribution sector. Consumers will be able to choose between their power suppliers in line with the telecom services. 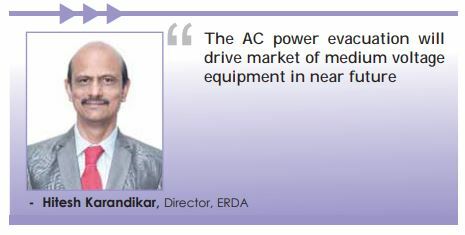 Customers are demanding affordability, reliability and availability of power instead of earlier requirement of only a supplier of power, observes Hitesh Karandikar, Director, ERDA. The Ujjwal DISCOM Assurance Yojana (UDAY), launched by Government of India in November 2015, reduced average national AT&C losses from 21 per cent to 18.8 per cent. However, Karandikar said, there is still lot of scope of improvement in this regard – particularly the billing efficiency of distribution companies (DISCOMs) needs to be improved. The central government has taken an initiative to install smart meters in all the states. With smart metering DISCOMs will be in a position to engage with customers, meet peak demand, manage PPC and increase billing efficiency. Greater transparency and accountability will come into the system. DISCOMs are looking forward to adopting smart metering solutions to reduce AT&C losses. Indian government has an ambitious plan to increase the power generation capacities both in public and private sectors. Also, there is great emphasis on power generation by renewable energies like wind and solar energies. The government also has an ambitious plan to provide electricity to every household in India. 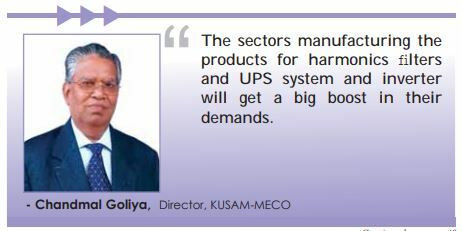 To be able to achieve the target of providing electricity to every household in India, there has to be a very strong and reliable distribution network which will provide uninterrupted power everywhere, opines Chandmal Goliya, Director, KUSAM-MECO. Electrical distribution sector is becoming more quality conscious and committed to energy conservation. According to Karandikar of ERDA, quality control order has ensured that only BIS certified good quality and safe distribution transformers, energy meters, wires, switches and plugs and sockets are used in the electrical distribution system. Use of such quality products will ensure safety of people and equipment and reduction of AT&C losses, he adds. R Prakash, Country Head – Marketing & Service, Easun – MR, Chennai also observed: The gladdening area is more and more focus is being thrusted upon ensuring not only 24x 7 supplies, but also quality power to consumer. Several grid expansion programmes such as the GEC and cross-border links are underway to expand the physical grid infrastructure. Further, transmission utilities, at the central and state level, are expected to invest significantly in new technologies to make grids more reliable, resilient, secure and smart, informs Gautam Seth, Joint Managing Director, HPL Electric & Power Ltd.
To tackle this situation government schemes, such as Accelerated Power Development and Reform Program (APDRP) for urban areas and Rajiv Gandhi Grameen Vidyutikaran Yojana (RGGVY) for rural areas, were initiated with aim to bring in investment and creating an efficient distribution infrastructure throughout the country. Further the scheme of Ujjwal DISCOM Assurance Yojana (UDAY), is turning out to be a saviour for most of the DISCOMs signed under it, with early signs of financial recovery being noticed, Ray opines. India accounts for around 3.4 per cent of global electricity consumption having 5th largest power generation capacity. The power distribution sector is going through a rapid transformation phase. Increasing pressure of expanding reach, reducing operational cost, minimise downtime and improve productivity is forcing distribution sector to explore new ways of keeping pace with the demand of reliable power supply. Amidst high rate of power transmission and distribution (T&D) loss combined with pricing pressure, drastic efficiency boost in distribution networks seems to be the only way out for utilities to remain commercially floating, said Vineet Jain, AGM – Telecontrol, WAGO Pvt Ltd. Recently the government has taken initiatives to increase private participation in electricity distribution through distribution franchise model and sub-contracting of non-core operations. Regulatory reforms for this sector including UDAY and SAMAST schemes have shown early signs of T&D companies’ recovery. There are important steps taken towards strengthening of sub-transmission and distribution networks and metering of distribution transformers and feeders. In addition to these measures, according to Jain, one of the important inclusions is IT enablement of distribution sector to improve the strategic, tactical and operational efficiency. Instead of merely distributing energy, the interplay between decentralised producers and consumers must be intelligently coordinated. This requires sophisticated digitalisation strategies and business models. Smart grid technology will surely enhance grid reliability and efficiency by automatically responding to system disturbances in real-time, Jain claims. Power distribution sector is still struggling for lot of inefficiencies in the distribution due to T&D losses. Also, this sector is still far from 24×7 availability front in non-metro cities, semi-urban and suffering heavily in rural areas. T&D losses correspond to electricity produced but not paid for. T&D losses are caused by a variety of problems, including energy sold at low voltage, sparsely distributed loads over large areas, inadequate investments in the distribution system, improper billing and theft. Another important and highly discussed cause of the problems being faced in the power sector is the irrational and unremunerative tariff structure, opines Yelegaonkar. All the above issues highlight the importance of initiating power sector reforms at the earliest and the need for tariff rationalisation. But, Yelegaonkar sounds quite optimistic as he said: It is definite that these issues will improve as we have already seen in the field of rural electrification and pump-set energisation, country has made a tremendous progress. About 85 per cent of the villages have been electrified except far-flung areas in North Eastern states, where it is difficult to extend the grid supply, he added. India is making a steady growth on the transmission front and the sector has witnessed commendable growth over the last few years with substantial capacity additions. An estimated Rs 22,60,000 crore investment is required in the transmission sector to meet future peak load, which is expected to reach 234 GW by 2021-22. Participation of private players into the distribution sector has also been encouraged through various models such as public-private participation as in case of Delhi and Odisha and more recently through input-based distribution franchisee models in Maharashtra, Madhya Pradesh and Uttar Pradesh. If we look at government’s ambitious project of smart city development, to get continuous supply of power to the smart city, it is essential to have strong and smart transmission and distribution (T&D) systems. But today’s T&D systems seem to be inadequate to meet the increasing power demand of smart cities. With rise in demand of clean and affordable electricity, the government has announced an impressive goal to add 40 GW of rooftop solar (and 60 GW of medium- and large-scale grid-connected solar projects) by 2022. It will turn out to be a progressive step to provide affordable energy source and combat climate change. 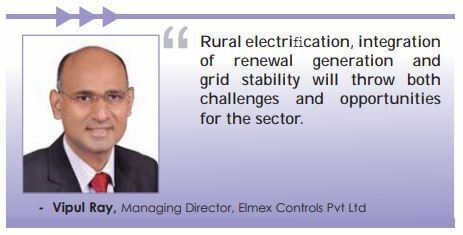 Rural electrification, integration of renewal generation and grid stability will throw both challenges and opportunities for the sector, said Vipul Ray of Elmex Controls. 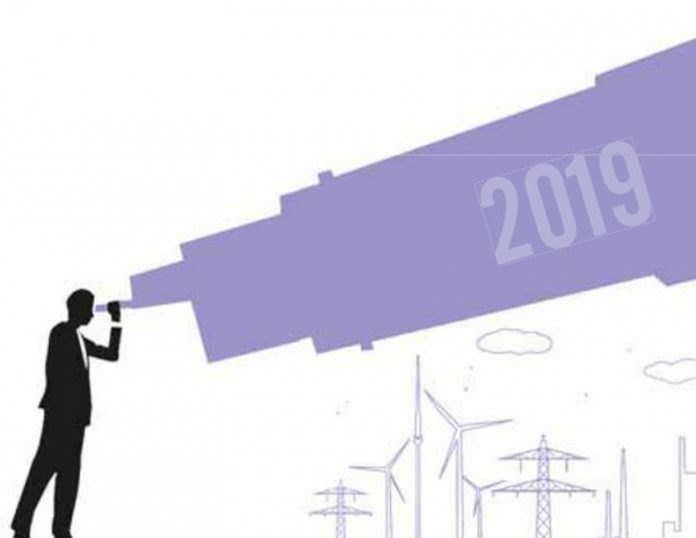 Let’s take a look at what will drive the power distribution sector in 2019. Hitesh Karandikar of ERDA also anticipates that electricity consumption is expected to grow exponentially in coming years due to success of Saubhagya scheme, owing to availability of power and changes in lifestyle e.g. increase in use of appliances such as air-conditioners and refrigerators. Therefore, utilities have to gear up to meet this demand. But AT&C losses of average 18.8 per cent is still very high according to global standards. The next target of DISCOMs should be to reduce the AT&C losses to a level of 7 to 8 per cent. This will require better and smart metering and huge investment in the infrastructure. According to Karandikar, this requirement will drive the power distribution sector in future. In order to meet the demand, it is imperative to develop incremental power distribution infrastructure and this would require substantial long-term capital expenditure from public and private companies. This will also fuel growth of ancillary sectors including substation equipment, automation components, information technology, towers etc. Manufacturers of these products will have to timely strategise and deliver their maximum potential value to the distribution sector. “Unprecedented use of modern automation technology integrated into decentralised suppliers, intelligent distribution substations and virtual power plants optimising control of the distribution grid will drive the power distribution sector. This will enable integration of IT and OT to shorten data collection, analysis, review and reaction time for better efficiency,” comments Vineet Jain of WAGO Pvt Ltd.
India is also committed to add 175 GW renewable energy into the grid, out of which 100 GW is from solar generation. This wide spread solar generation will require DC distribution and DC switchgear equipment. Also, the AC power evacuation will drive market of medium voltage equipment in near future, predicts Karandikar.